The Japanese Maple is native to Japan, North Korea, South Korea and eastern Mongoliavin. 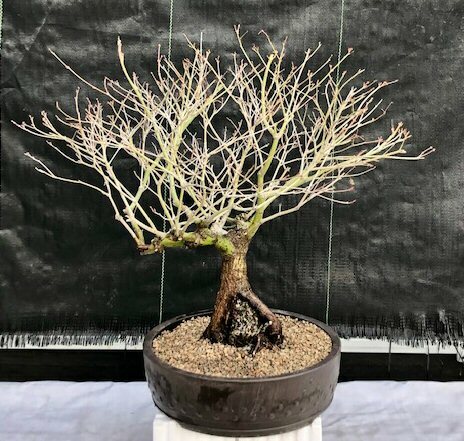 They have been in temperate areas around the world since the 1800s and many cultivars of the specie are still found world wide because of their attractive leave shapes and stunning colors. The leaves have a smooth texture giving this specie the name Smooth Japanese Maple. Leaves turn from green to golden yellow color in the fall. Circumference of roots and rock measure as 10.5". Diameter of roots and rock measure as 4.75". 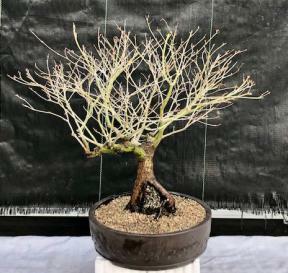 Most desirable for bonsai enthusiasts and has been a subject in art for many years. Deciduous, keep outdoors. 26 years old, measures 18" x 19" x 16" tall. Potted in a 9.5" unglazed lotus shaped ceramic container. Suitable humidity/drip tray is recommended. To purchase add $12.95. Circumference of roots and rock measure as 10.5". Diameter of roots and rock measure as 4.75". May be shipped with no foliage during autumn and winter.